It certainly gave me a shock. Rochester a female? He of the flashing eyes, the furrowed brow, the angry strides, the dominating hero of one of my favourite novels? Surely not. And then I remembered Tim, a student in my adult ‘A’ level English evening class when we were studying Jane Eyre. I asked my students what they thought of Rochester and the women made comments like ‘powerful’, ‘dominant’, ‘alpha male’, and ‘what more could one ask of a hero?’ . Tim, however, disagreed. ‘I think he’s an absolute pillock!’ he growled. There was a stunned gasp. 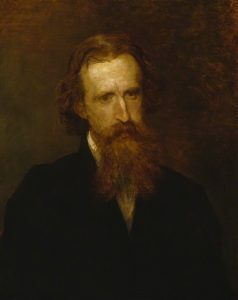 So who was Sir Leslie Stephen (1832-1904)? He is perhaps best remembered as editor of the first Dictionary of National Biography. He was also father of the writer Virginia Woolf and her sister, the artist Vanessa Bell, both part of the Bloomsbury Group who revolted against Victorian sexual, social and artistic mores. Stephen obviously also enjoyed being controversial, as we can see from his debunking of Rochester’s masculine identity. 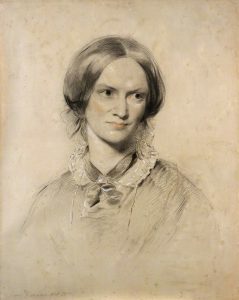 He thought that Charlotte Brontë meant Rochester to be a sophisticated man of the world, one who has experienced its dark side, but ‘he really knows just as little of the world as (Jane) does…. He is supposed to be specially simple and masculine, and yet he is as self-conscious as a young lady on her first appearance in society, and can do nothing but discourse about his feelings and his looks…’ The moment I read this, I could see that he was right; Rochester does go on about his ugliness. Could it be that Stephen himself was disconcerted to discover what women really wanted in a hero – the ability to talk about his emotions, say – however unrealistic that might be. 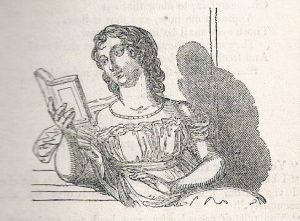 One might argue that Charlotte’s temerity in daring to create a Rochester who was attractive to women readers was more than equalled by male authors, like Charles Dickens, creating female characters – Dora Copperfield in David Copperfield springs to mind – who conformed to their own fantasies of a sweet, ignorant and desirably passive female. What is interesting here is that I don’t think that Charlotte herself saw it the same way. She thought that the young Rochester being deliberately trapped into marriage with a dangerously unstable woman was far more immoral. His marriage was invalid in the eyes of God. Even now, 170 years after it was published, Jane Eyre still has the power to divide opinion. 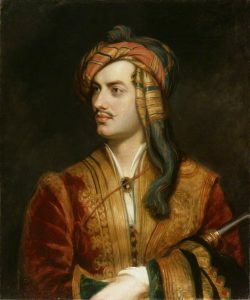 Photos of Charlotte Brontë, Lord Byron and Sir Leslie Stephen courtesy of the National Portrait Gallery. 9 Responses to Is Mr Rochester really a Woman in Disguise? What an interesting post! I didn’t know about this critic, but in a sense he’s right. Rochester might well be the very first depiction of the female fantasy of what a hero in fiction ought to be. A man who admits his feelings, talks about them and in a way is indeed something of a feminine mind disguised in a male body. If we are honest, I believe we all put words in our hero’s mouths that we know real men would never say! That’s surely the point of romantic fiction. We want the vicarious thrill of a romance where the man we are falling in love with says all the right things. The truth is in life, men don’t know the script! They never say what we hope or expect they might say. Or rarely. So yes, I agree. Rochester does indeed have empathy with the female mind and her desires. Thank you for your perceptive comments, Elizabeth. You are, of course, spot on. Men, on the whole, just don’t get the script women want to hear – and, perhaps, if they did they should be distrusted. It’s Catch 22. A very interesting post, as always. I agree that Charlotte was sympathetic to Rochester’s plight. What I think is particularly interesting is that Rochester’s marriage was invalid. I’m not a legal historian, but when I was researching the divorce laws in Halbury’s Laws of England, it said that a marriage was invalid if there had been any form of trickery, such as concealment of madness. So I think Rochester could have had his marriage annulled. If that was so, it’s interesting that Charlotte, a vicar’s daughter, didn’t know of this, or chose to ignore it. That’s interesting, Amanda. I bet she didn’t know it. It might be one of those obscure laws that you only found out about if you needed it. Rochester – had he been real – might well have looked for this out. Maybe Charlotte knew, but chose not to have Rochester take that route, because he knew his divorced wife would then be without any support. Madhouses of the time were not pleasant places, after all. That’s an interesting comment, Rachel. Rochester, after all, tries to keep Bertha safe and she has Grace Poole to look after her which, as you say, is more than she’d have got in a Victorian mad house. Fascinating, Amanda. What interests me, though, is whether Sir Leslie Stephen knew this – and chose to ignore it. Was he trying to put down Charlotte Bronte, one wonders. I can’t help thinking that ‘Jane Eyre’ must have outsold Stephen’s magnum opus, ‘History of English Thought in the 18th Century’ many times over! What a fascinating and stimulating post! I particularly like your comparison between Charlotte Bronte’s Rochester, the kind of hero women would like to read about, and the sweet and passive female characters created by Dickens and some other male writers, who fit the fantasy of the Victorian angel in the home. Thank you for your comment, Eleanor. There were also some virulent contemporary comments about the portrayal of Jane Eyre herself. One such, from 1848, calls Jane ‘a decidedly vulgar-minded woman … whom we should scrupulously avoid for a governess’!